Central Appalachia and south Wales were built to extract coal, and both regions have experienced economic depression, labor unrest, and outmigration. Wales lost 20,000 coal jobs between 1980 and 1990, and central Appalachia lost a similar number of coal jobs between 1994 and 2014. After Coal focuses on coalfield residents who did not join the out-migration, but chose to remain in their communities to build a diverse and sustainable economy. Filmmaker Tom Hansell spent five years recording interviews and location footage in the mountains of eastern Kentucky and the valleys of South Wales for this project, which included a documentary film, and a face-to-face exchange between coalfield residents from Appalachia and Wales. 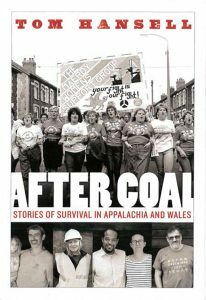 The stories in this book are told through interviews and photographs collected during production of the After Coal documentary. Readers experience eyewitness accounts of coal booms, bitter strikes, the loss of livelihoods, as well as the strong bonds that have inspired residents to keep their communities alive after the industry that built their towns collapsed.